Future Song Foundation is a non-profit organization whose mission is to provide education and musical opportunities underprivileged youth. 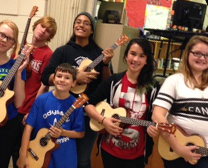 They support access to music, by providing teachers, instruments, and mentorship. As the Club members progress and cultivate their skills, they will have the opportunity to also perform out in their community. The music program is already scheduled to perform at their Doors to Dream event in February.